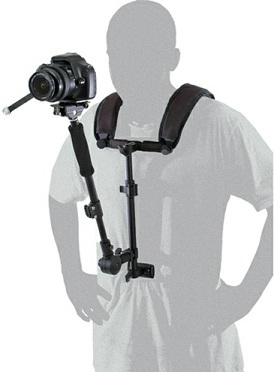 This harness style support enables the photographer/videographer to keep both hands free while shooting and gives him/her added mobility. The body harness fits comfortably on the shoulders. The center column of the harness adjusts from 11.75 to 18.5. The camera support column adjusts from 14.25 to 21.5 in length and can be angled up to 180. The camera platform tilts from 45 up to 45 down featuring a secure sawtooth style lock. The padded and breathable shoulder supports are adjustable for shoulder width and even the contour of the shoulder. Complete with zoom control ring, camera quick release plate, anti-twist plate, waist strap, and carry/ storage nylon bag. Primarily aluminum construction keeps the weight of the V9 to only 3 pounds.